With a voice as priceless as that of a certain Sam Smith, his new album is going to cause waves! The unmistakable, anguish stricken vocals - the artist that has sold millions upon millions of copies. Oh, and won an Oscar. The album itself starts off with the first track that was released before the album dropped. ‘Too Good At Goodbyes’ has had a hammering on my radio shows recently and its classic emotion from Smith with those heart strings well and truly tugged. ‘Burning’ is one of the more upbeat hits from the album and when choir hits - you’ll be singing along. This is followed in the album by another emotional adventure before a slight change. Enter gospel choir (again). ‘One Last Song’ meticulously placed towards the start of the album shows the balance between upbeat pop and hard-core emotion. The gospel choir help to keep this song sound as positive as possible, even though the lyrics are of hope more than positivity. Further in to the album, one of my favourite tracks appears and my bet on one of this years biggest hits. ‘HIM’ tells the story of Smith finding a new lover (at last! ), but of the struggle he still encounters with passers by accepting the love that one man can have with another. This is what I and a lot of people will empathise with. I still feel like, as happy as I could be with a new lover, people still in 2017 somehow have a problem with how LGBTQ+ couples show affection towards one another, even the simplicity of holding hands. The middle of the album sounds like the part of a relationship in those first few months where you are still smitten with each other and are just having fun with your partner. An album which describes a story throughout its songs is always a winner in my books. In true story format, the end of this tale is polite and typical of Smith. He is clearly in a happy place with his new-found love and in the track ‘Scars’ he can be heard describing the scars of past relationships but nothing comparing to the happiness he has unearthed. Overall, this album is an emotional rollercoaster bringing tears of both joy and happiness at the journey he has taken us on in his love life. Hopefully now we can hear some positivity and fun in his life again like in ‘Latch’ – his collaboration with Disclosure way back in 2013. You never know, he might surprise us and bring out a drum and bass ragga grime odyssey! On second thoughts, I highly doubt it! 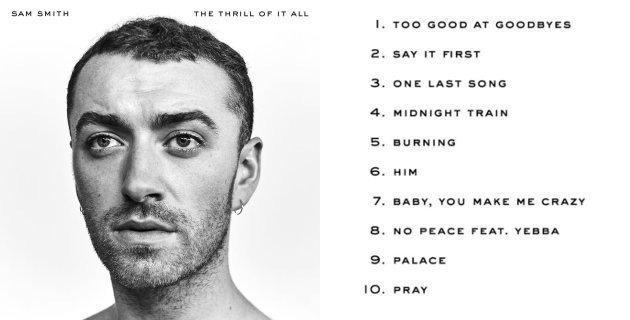 Sam Smiths new album, ‘The Thrill Of It All’, is out today. It will undoubtedly be one of this years biggest albums. Time will tell.